Yesterday we showed you what will surely be 2012's worst example of box art. So it's only fair that today we cleanse the palette with what could easily be 2012's best. 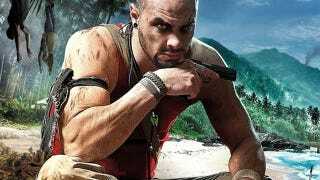 Far Cry 3, take a bow. Well, not you, WTF head-in-the-sand guy. You just sit there. Isn't it great? Once you get past WTF head man, check out the detail on the thug. The tropical setting that's initially alluring, until you notice it's on fire and there are dead people hanging from a tree. All of which sounds like the same standard, too-busy formula most covers employ, but the difference here is you look and then keep looking.